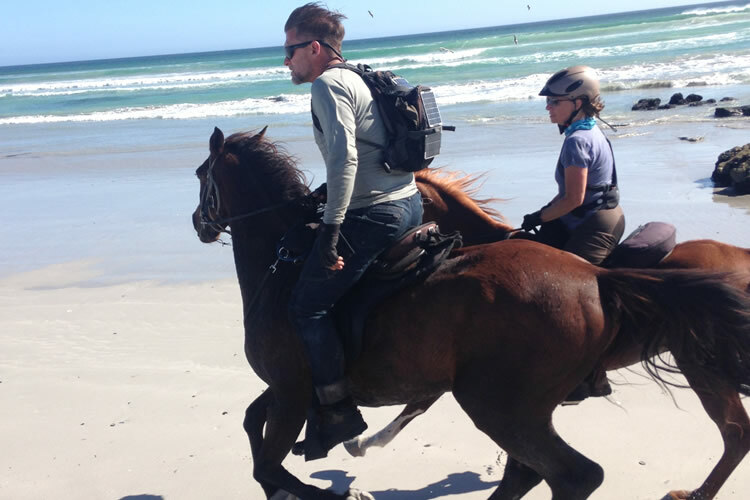 From historic Stellenbosch, the winemaking heart of the Cape, to the southern tip of Africa, this diverse expedition spans 330km over 11 riding days; vineyards, mountain passes, white sand beaches, the splendor of the Cape floral kingdom and storm ravaged Cape Agulhas. A paradoxical mix of hard riding and good living. Our adventure begins in the historic Dornier estate on the edge of Stellenbosch, the heart of winemaking in South Africa. After meeting your fabulous hosts, Barry and Joe, you will be paired with your horse and hop on for a short introductory ride to familiarise yourself with your adventure tack and your new best friend. On return to Dornier there will be time for a cellar tour in the late afternoon and for the trail overview briefing before dinner. Our first day of riding is a big one, with four tastings scheduled and an honest 30km in the saddle. A short climb out of the serene beauty out of the Bloukliprivier Valley and over a low pass in the Helderberg Mountains reveals an impressive vista: the majestic sweep of False Bay, the Helderberg Basin and the Hottentots Holland Mountains in the distance. 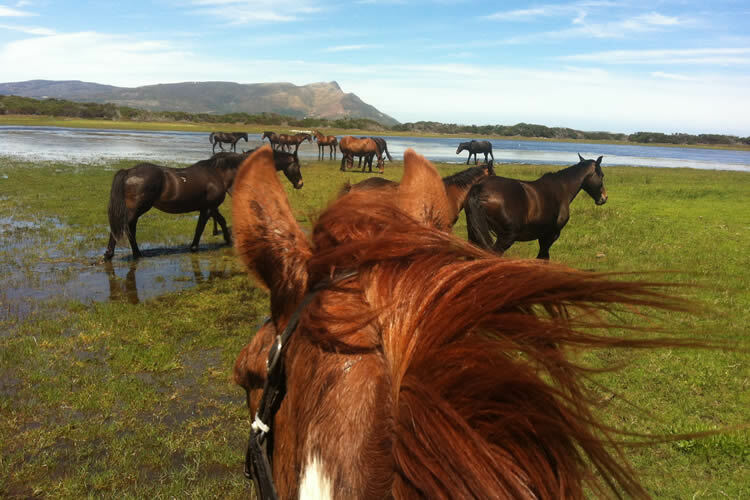 We ride to historic Lourensford, established in 1700, arguably one of the most beautiful wine estates in the world, before lunching at neighbouring Morgenster and an afternoon tasting at Waterkloof with its elegant wines, award winning architecture and biodynamic vineyards worked exclusively by horses. After a late afternoon wiggle through the adjacent vineyards, the evening is spent at Bezweni Lodge, high on the slopes of the Hottentots Holland Mountains with incredible views across False Bay, the Cape of Good Hope in the distance and Table Mountain. Our day starts with a trek over the Hottentots Holland Mountains via the ancient Gantouw Pass, the original gateway to Africa. Everything about this pass is impressive: the grooves in the rocks from centuries of the passage of wagon wheels, the realisation of the mammoth task that it must have been to get a laden wagon over the pass, the vista back toward Cape Town and her famous mountain, and the view onwards toward the African interior – called the Overberg by early travellers. 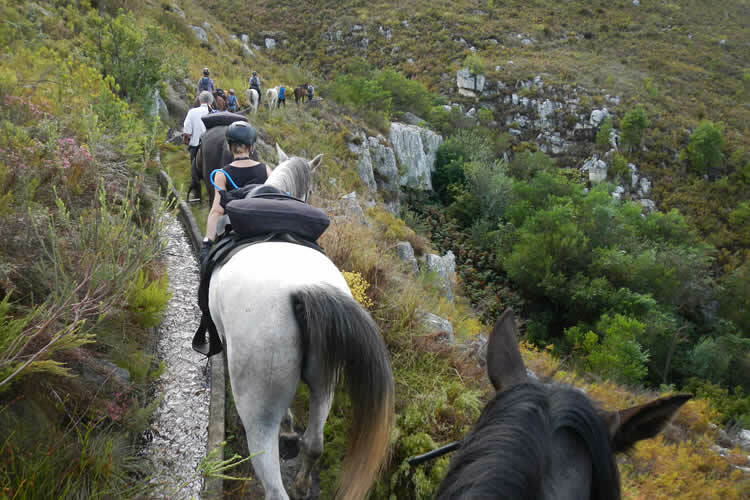 This day brings some of the most spectacular scenery, riding up against the foot of the Groenlandberge with its pristine fynbos, regimental fruit orchards and vineyards. After lunch at the elegant Pool Room at Oak Valley the night is spent in a luxury tented camp pitched high on the slopes of the mountain with spectacular views down the valley. 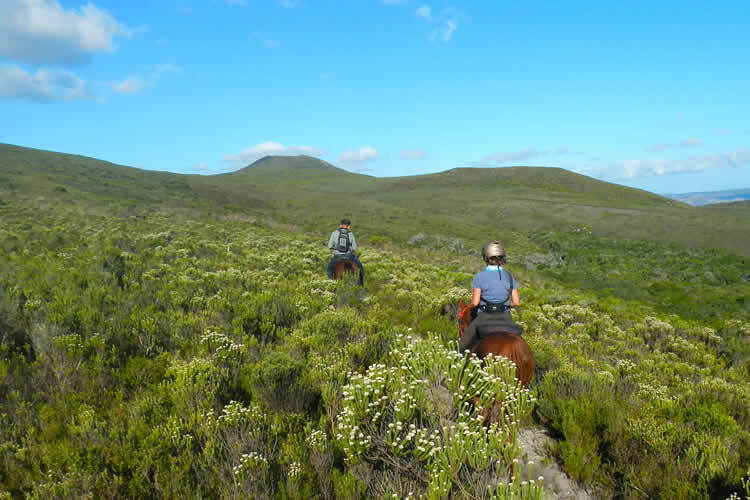 We ride into the beautiful and dramatic Groenlandberge, through the nature reserve, it’s rocky hills resplendent with the Cape’s endemic fynbos. Beyond, the picturesque Vyeboom valley is a mosaic of farms and smallholdings overlooking the Theewaterskloof dam. We camp again that night at the waters edge. Our route takes us along the edge of the Groenlandberg Nature Reserve through the farms hugging its slopes along the historic Van der Stell Pass, to Botrivier and Beaumont WInes, where the cellar tour by owner Sebastian Beaumont is not to be missed! We leave Beaumont wines, one of our favourite venues, and tackle the historic, steep and very dramatic Houwhoek Pass to the historic hamlet of Houwhoek established as a rest stop for travellers on the colonial highway in 1834. After a short climb up the Dassenberg we descend into the otherworldly, green, fertile Elgin Valley and our digs for the night, the quirky but super slick Old Mac Daddy. This is a special days’ riding: we climb out of the Elgin Valley amid the fynbos of the Koegelberg Nature Reserve onto the flat Plateau of the Perdeberg (the Horse Mountains) for a tasting and lunch at the fabulous Iona Winery, in its mountain microclimate, before descending to cross the Botriviervlei with its wild horses, flocks of flamingos and pelicans.The day’s ride ends with a blast along the beach to the small fishing village of Hawston. Here we spend the night in a luxury, tented camp immersing ourselves in the history, culture and cuisine of the Cape Malay people. •	Hawston: dinner and luxury tented camp overnight. After breakfast we climb away from the coast, heading into the secluded Hemel en Aarde Valley. 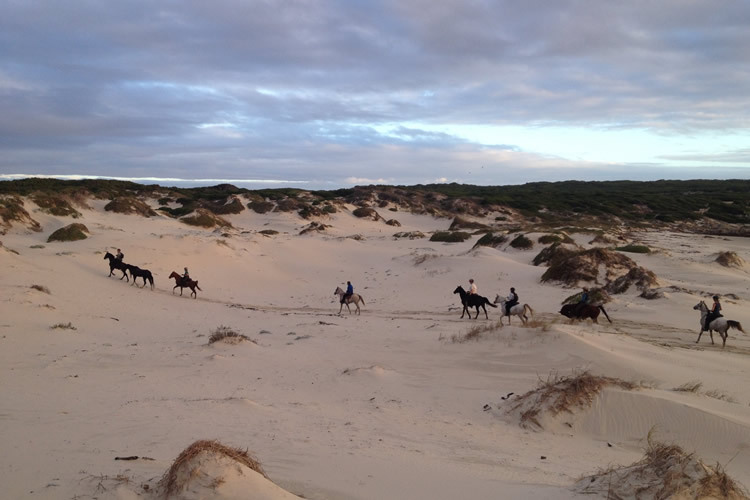 Day six is a short day’s riding, a respite for the horses before the long, and fast, day 9. We will enjoy sampling the award winning Newton Johnson Wines with a lazy horseman’s lunch in the tasting room. After lunch a slow amble through the unique fynbos of the region takes us to our sunset tasting at the majestic Bouchard Finlayson Estate, before a final short ride to our tented camp and a traditional South African braai, or BBQ, for dinner. •	Hemel en Aarde Valley: dinner and luxury tented camp overnight. Day 9 is a big day and one of the most memorable. We descend the Kleinriviersberge via an old elephant path to skirt the seaside town of Hermanus before letting loose on one of the best stretches of beach riding on the planet, the 17km of Walker Bay. If you are riding the trail in spring you may be treated to the sight of breaching whales in the bay before riding on through pristine fynbos and the last vineyards of our journey on the Lomond Estate, to the secluded elegance of Farm 215. 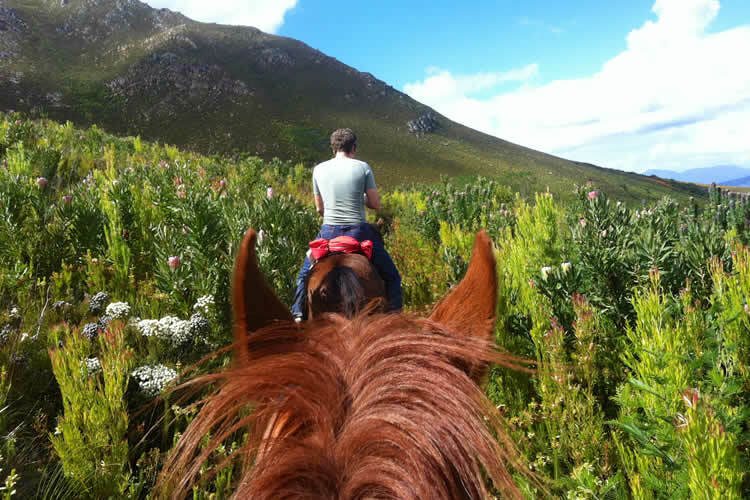 After yesterday’s massive effort, we take it easy on ourselves and the horses and have a relaxed late start to the day, enjoying the pristine fynbos reserve that is Farm 215 over a leisurely breakfast before a short and relaxed ride to the quirky nearby town of Baardskeerdersbos , literally Beard Cutters Bush, after the spiders in the region that harvest hair for their nests while you sleep! Our tented camp for the night will be specially spider proofed. Our route takes us steadily South East towards the coast, through sparsely inhabited coastal hills and Cape fynbos, interupted occasionally by isolated farms. The landscape now begins to get wilder as we approach the storm ravaged tip of Africa! 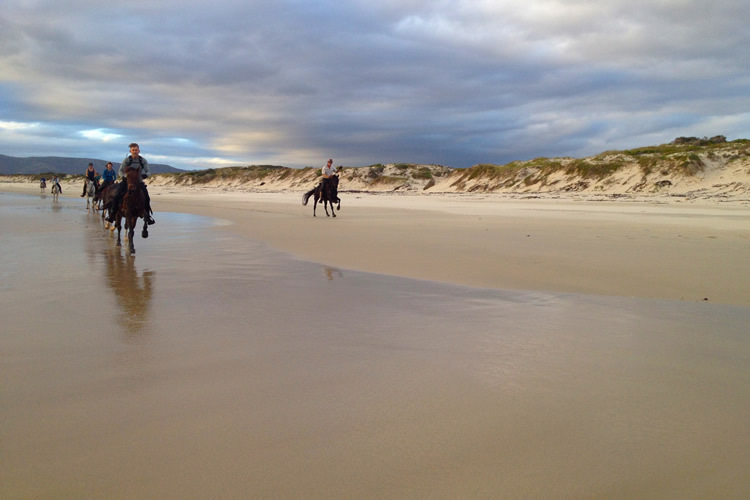 Our final days’ riding brings us back to the coast for a last 3km canter on pristine hard white sand. We travel through the Agulhas National Park before reaching our destination, the southernmost tip of Africa: Cape Agulhas. We spend a final night together in our luxury tented camp, perhaps a little sore and tired, but certainly exhilirated at our achievement: we have conquered the Cape of Storms! After breakfast you will depart as arranged.